Dennis Phan was virtually unknown until he won the U.S. junior men's figure skating title in 2003. Native Texan Dennis Phan was virtually unknown until he won the U. S. junior men’s title in 2003, but he’s been a solid contender since then. Phan had never made the top three at the lower levels, although he came close in novice when he was fourth in 2000. He continued to be successful last season, winning the Gardena Spring Trophy and taking the silver at Skate Bled, his first two international medals. 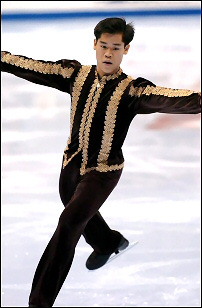 Phan placed 14th in his first year in seniors at the 2004 U. S. Nationals in Atlanta, then finished the season by placing seventh at the World Junior Figure Skating Championships in the Netherlands. “My goals for last season were just to skate well at Nationals, make it to Junior Worlds, and skate well there,” he said. “This season, I’m hoping to make it to the Junior Grand Prix Final and move up at Nationals. Eventually, I hope to go to the Olympics and Worlds. I plan to skate as long as my body lasts.” Phan began the 2004-05 season by winning the senior men’s event at the Silicon Valley Open. Phan, who turns 19 in next week, is scheduled to compete at the Junior Grand Prix in Los Angeles. Phan began skating when he was eight. “My older brother plays hockey so I started playing for a few months just to get out of the heat in the desert,” he recalled. “But skating interested me so I moved out of hockey and into skating.” He landed his first triple salchow when he was 13 and a triple Axel at 17. He has also been working on a quadruple toe loop. “It’s pretty close,” he said. “I’m planning to have it by the summer.” Phan also plans to work on the triple Axel-triple toe and triple lutz-triple loop combinations. Phan began working with coach Tammy Gambill when he was nine. He trains in Riverside, California, practicing on ice for two or three hours a day, six days a week. He only does two days a week of off ice work for about an hour and a half each session. Phan was slowed this season by a back injury sustained at the Sofia Cup and was unable to train as much as he wanted, especially on the triple Axel and the quad. Phan usually changes both of his programs each year while Phillip Mills choreographs them. Last season, he used Pearl Harbor for the short and The Three Musketeers for the long. “My coach and I choose the music,” he said. “Dennis has to really like the music to skate to it,” said Gambill. “He brought in the CD for Pearl Harbor and the more I heard it, the more I liked it. Phillip found the pieces we used. I brought in the music from The Three Musketeers. A friend of mine heard the music and told me it would be a great piece for Dennis to show off his lines and artistry.” This season Phan is using music from the soundtrack Crouching Tiger, Hidden Dragon for the short and Time Line for the long. Off ice, he said, “I listen to a wide variety of music. There’s none I don’t like.” Among his favorite groups are Good Charlotte and blink182. To relax, Phan also likes to go out with friends, watch television and movies, chat on the computer, and play some basketball. He keeps all the stuffed animals and skating pins from his competitions, but doesn’t have any other hobbies. He enjoys traveling to skating events and most enjoyed Slovenia and Italy, especially the Italian food. Phan has graduated from high school and is taking a year off to concentrate on his skating. Next year, he plans to begin taking a few courses at a community college near the rink. Eventually he plans to go to college to become an optometrist. Although Phan helps Gambill work with some of her younger students, he doesn’t plan to be a skating coach.